This eco-plastic 18 SMD GU10 spotlight features a 60-degree beam angle; designed to output the widest beam angle available of any SMD spotlight on the market today. This spotlight will install into any GU10 socket with an input voltage of AC200-240V and is designed for any domestic, commercial or retail installations. Using only 10% of the energy when compared to the older style spotlight s, thereby offering significant savings that consumers simply cannot ignore in the long run. Offering the latest Aluminium heat-sink design, this helps to disperse any unwanted heat from the LEDs which protects the overall lifespan of the chips. Lasting 50,000 hours compared to a halogen lamp which last 2000 hours, these spotlight s pay for themselves within six months of installation. Homeowners and businesses can now go years without the hassle of having to change spotlight s. These LED equivalents feature shock and vibration resistant technology, there is no filament to ever burnout or break-in, so they run considerably cooler than standard filament spotlight s.
Recent advances in LEDs, household electrical consumption from lighting products is being greatly reduced when using low-energy LED lighting. The Aluminium Glass Covered GU10 LED spotlight offers consumers a cost effective SMD light spotlight with all the benefits and limited drawbacks. 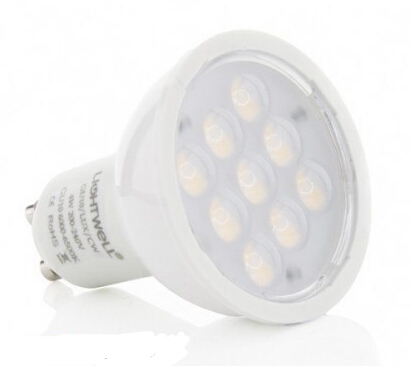 These standard sized LED bulbs are a direct replacement for your existing GU10 lamps. For a one-off investment you could recover the cost of your order within six months of installing your new bulbs. After recovering your initial investment, every six months thereafter you will continue to make the same massive savings off current energy bills over the expected 50,000 hours life of the lamp.